Artificial Intelligence (AI) is a term we are hearing more and more these days. Whether you believe it will ‘take our jobs’ or not (I personally believe it will change our jobs! ), it will surely play an ever-growing role in the future of IT and computing. 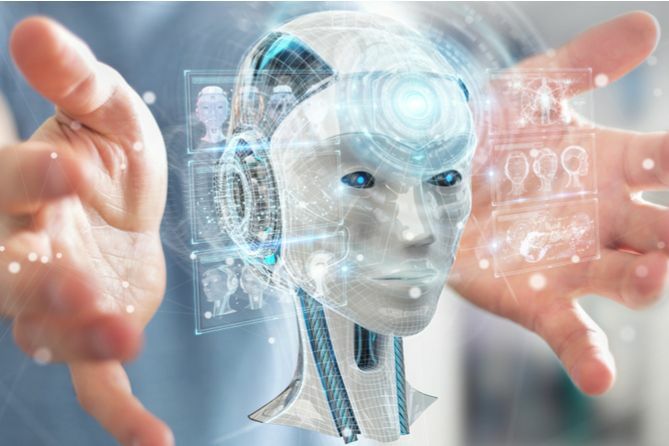 Although people have been talking about AI since the late 1960s, it is still in its relative infancy. Looking as far back as the computer ‘Hal’ from 2001: A Space Odyssey (1968), it is proving to take many decades to make such intelligent technology a reality. Whilst amazing technical advancements have been made since then, demand has increased due to more possible use cases. 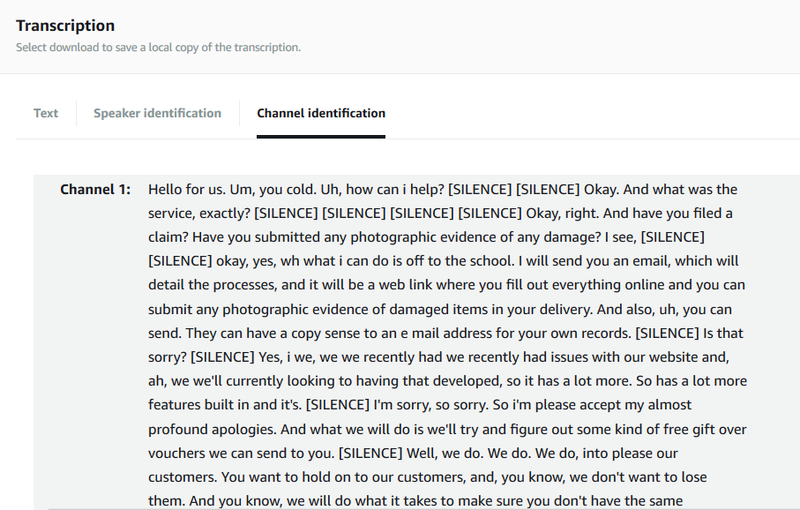 Naturally, there are some inaccuracies in certain parts of the transcription, particularly with names (e.g. ‘for us’ is meant to be my colleague ‘Faraz’). However, Transcribe gives us the option to upload CSV or TXT custom vocabulary files to improve the accuracy by defining things (‘entities’) such as the names of places, people etc. 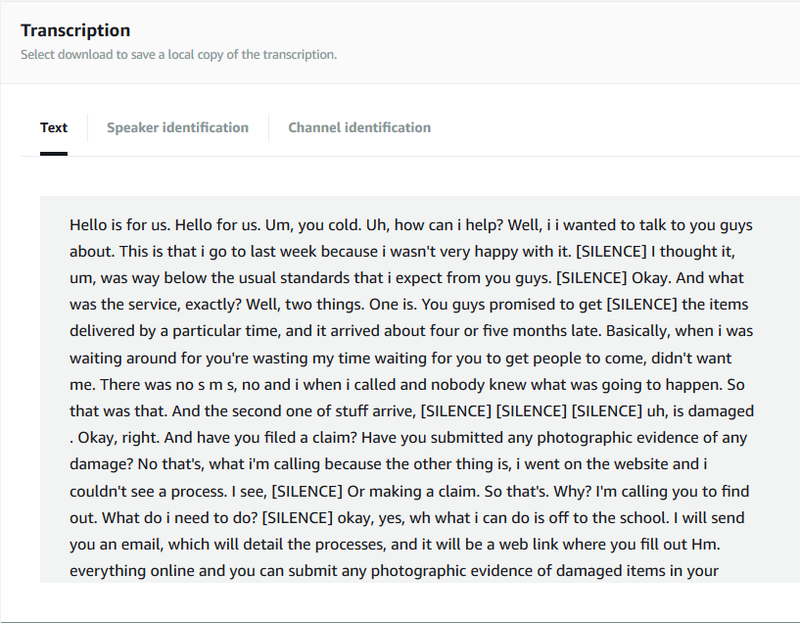 Although Transcribe did get the essence of the conversation right. Amazon Comprehend can give some meaningful insights once you have your transcript. It can detect up to 10 different voices using the ‘speaker identification’ feature, although its accuracy is significantly increased if you specify the number of different speakers yourself. The overwhelming NEUTRAL sentiment makes sense as the agent is trying to be impartial, with very little POSITIVE or NEGATIVE sentiment in there. A good listener should not offer any opinion or sentiment either way. These scores can be saved as JSON files and stored using Amazon’s S3 service (think ‘block storage in the cloud’). In order to further manipulate and analyse the data, we will look at this in the Use Cases section below. 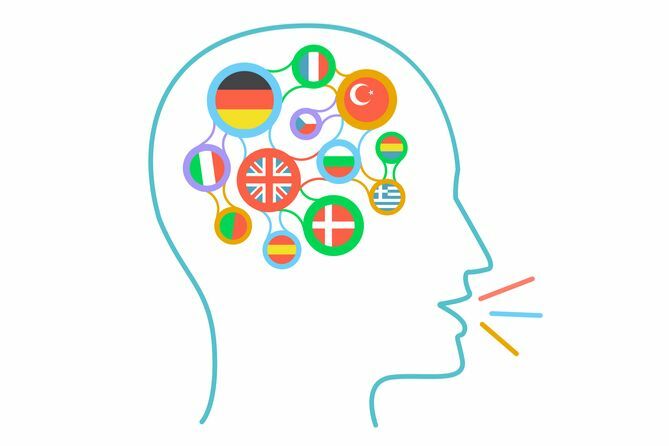 Translate can dynamically detect the source language, so there is no need to specify the source language – only the target language. It can also work on text files and real-time streams. However, the audio or video streams will need to be converted to, for example, WebVTT files, where WebVTT is a W3C standard for displaying timed text in connection with HTML5. 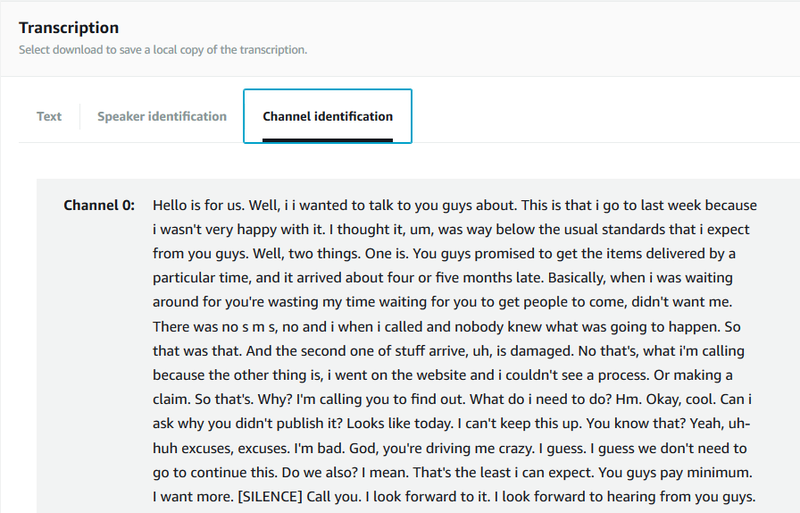 Each line is translated with a time stamp in the stream, which enables tracking of who is saying what and when. The web console is OK for a one-off single job. For a one-off batch of jobs, you could use a unix/linux script that incorporates CLI commands. However, for a truly automated system, it is best to use a Lambda function, as we will discuss next. The same code can then invoke Comprehend to get an idea of customer satisfaction as well as agent performance based on sentiment analysis. The data can be written to a variety of database solutions then be further manipulated using an analytics tool of your choice. Another example is web chat for multinational companies. Both customer and agent can be using their respective native languages and Translate can make the conversation bilingual. Once again, Comprehend can be employed to gauge customer satisfaction and agent performance by looking at sentiment analysis scores. To find out more about AWS and how it can enhance your Contact Centre or Unified Communications system, register now for our Customer Experience event with AWS on 13th November 2018. To find out how we can help you, please contact us to talk through your requirements.